There is a farm about twenty minutes outside of my hometown that throws a massive festival every fall. It runs every weekend from the end of September through Halloween. There is a pumpkin patch, tractor rides, face painting, music, food, an impressive corn maze, kettle corn and a general store filled with jars of jam, pickles, fruit, relish, and everyone’s fall favorite, apple butter. As a child, I loved apple butter. I could not understand why we only had it in the fall. I wanted to eat it on everything. That hasn’t changed. The only problem is that traditional apple butter recipes call for quite a lot of sugar, which is off limits for me right now. One of the great things about cooking at home however, is the ability to improvise and customize your favorite things. 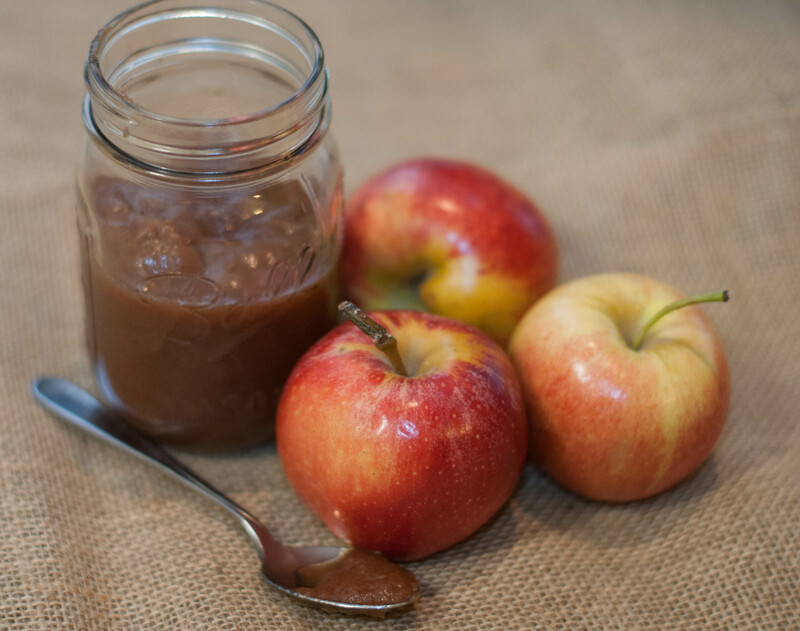 The trick to apple butter is not the sugar. Some good maple syrup and the apples themselves provide plenty of sweetness. The trick is cooking the apples for a long time. The best way to do this is in a slow cooker or crock pot. Using a slow cooker makes this one of the easiest treats you will make this fall. You basically peel some apples, throw them and your other ingredients in your slow cooker and go to bed, when you wake up all you’ll have to do is add some vanilla let it finish up while your start your day and then throw it in the food processor and puree it. The amount of time you have to spend in the kitchen is about eight minutes. Its hard to find many from scratch recipes that require that little effort. To top it off the recipe below is a small batch recipe that only makes about two pints. That way you won’t end up with apple butter coming out of your ears (fun mental image, I know), but you’ll have just enough to enjoy as a treat in the weeks to come. If you would like to make more to share with some lucky family members or friends the recipe is also easy to double or triple. Aside from using your apple butter on sandwiches and toast I recommend pairing it with roasted chicken as a dipping sauce. It is deliciously amazing. Attending that fall festival every year and scoring some delicious apple butter is one of my favorite memories. What is one of your favorite fall memories? Let me know in the comments below! Place your peeled and sliced apples into a 2.5 quart or larger slow cooker. In a small bowl, mix together maple syrup, cinnamon, cloves and salt and pour over the apples. Cook on low for 8 hours. Stir in your vanilla extract, breaking up any large chunks of apples that remain and cook for another 2 hours, uncovered. Pour your apples into your food processor or use an immersion blender and puree. Allow it to cool and spoon it into jars. Enjoy! Hi! 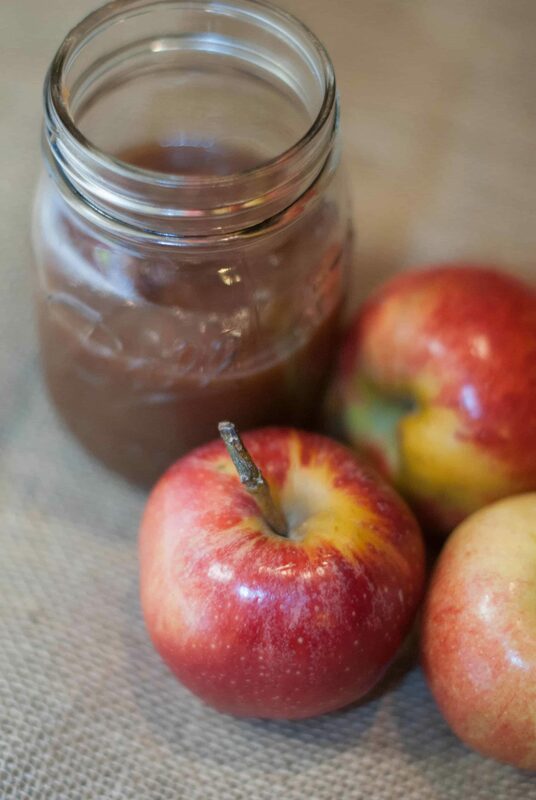 I am making your apple butter recipe right now. I sliced and peeled the apples last night and put them in the crock pot this morning. I am worried preparing the apples hours ago made them dry. Do you think I should add a little water to the crock pot? Pinning to try! Looks delicious! Just a reminder to anyone who is doing AIP – leave out the vanilla extract! How much does one batch yield? This sounds yummy!! What a great way to use some of our syrup that we make each year! How would you store it? In the refrigerator or freezer? If you’re planning on eating it fairly quickly it can be kept in the fridge, otherwise you could an in using a pressure canner. I don’t think freezing would change the taste or anything, so you should be able to freeze it but i am not 100% sure. Sounds yummy. Just bought a bushel of apples, so need to get busy with apple recipes, and I love apple butter. Thanks! How much of the coconut crystals do you suggest using? I am SO excited about this recipe! Hello Amelia, you actually do not need coconut crystals, that was a typo. The maple syrup gives you plenty of sweetness! I hope you enjoy the recipe. Awesome, thanks for clearing that up. Looking forward to making this!